The export situation for Christmas gifts has deteriorated in China this year, according to industry data. Experts and industry practitioners told the Global Times on Tuesday and Wednesday that homogeneous competition has remained a lurking threat to the industry. China's exports of Christmas gifts dropped nearly each month from January to September (except March and April) in 2016. In September, such exports slumped 0.9 percent year-on-year to $909 million, narrowing from drops of 8.2 percent and 23.7 percent respectively, in August and July, according to data revealed by data platform qianzhan.com in November. In 2015, exports of Christmas products amounted to $3.6 billion in total, chyxx.com reported in March, citing figures from the research institute Zhiyan Consulting. 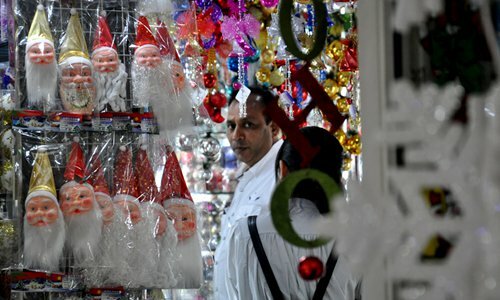 A domestic small commodity exporter surnamed Zong, who declined to disclose his full name, said that the business of exporting Christmas products has been getting tougher in recent years. His company Dongyang Daolin E-commerce Co, which is based in Dongyang in East China's Zhejiang Province, began manufacturing Christmas ornaments including garlands, rattans and Christmas trees in 2010, but orders from overseas clients have plunged in 2016. "As of Tuesday, we had received foreign orders of a little more than 2 million yuan ($290,000), far below about 10 million yuan in the same period last year," Zong told the Global Times on Tuesday. One reason Zong gave for the slumping business is the tough global economy. "We mainly export Christmas-related products to South American countries like Brazil, but weak consumption directly leads to a decrease in our orders," Zong explained. He also noted that intense competition among manufacturers squeezes profits. "There are too many homogenized Christmas products on the market. Many producers, especially those on Alibaba's online shopping markets like taobao.com, sell Christmas goods at a very low price to enlarge sales volume," he explained. Zhu Guojun, sales manager of Yunfeng Crafts Corp, which is based in Yiwu, East China's Zhejiang Province, said that his company's exports of Christmas products amounted to about 12 million yuan in 2016, slightly dropping from the corresponding period last year. His company mainly exports Christmas products to Europe and the US. Zhu also pointed toward the problem of homogenization, saying that the number of Christmas product exporters in Yiwu has burgeoned in recent years, but their products are more or less the same. "There's a lot of innovation in Christmas products produced in Guangzhou, and some Guangzhou-based manufacturers even applied for patents for their products. This is not the case in Yiwu," Zhu told the Global Times on Wednesday. Cai Qinliang, secretary-general of the Yiwu Christmas Products Industry Association, said that there are about 800 makers of Christmas products in Yiwu. "They have been encouraged to make unique, distinctive products, but this is not so easy," he told the Global Times on Tuesday. Zhu also noted that rising costs have been an obstacle to the business. "At the time of my father, the workers earned about 4 yuan an hour. They now earn about 10 yuan, but the prices of the products they make are almost the same," he said. Cai said that many Yiwu-based companies have tried to solve the problem by moving their manufacturing bases to regions that have lower labor costs. Cai also noted that despite difficulties, domestically made Christmas products still have a competitive advantage among overseas clients generally. "Particularly in Yiwu, the transportation costs are low. There's a small-commodity trade market where there are plenty of choices, and the Christmas gifts made here have reasonable prices," he said, adding that Christmas product exports in Yiwu in 2016 are almost on par with the previous year. He said that exact export figures will be released later. Many exporters are also trying new methods to boost their business. He Lihong, who runs a factory in Yiwu that makes Christmas gift bags, told the Global Times on Tuesday that the company started to provide products in a complete set, such as selling gift bags along with wrapping paper and cards, and this strategy has helped drive up their sales. "Orders from some of our customers in the US have increased by about 15 to 20 percent in 2016," He told the Global Times on Tuesday. Zhu also said that his company has started to use a new strategy by skipping intermediate agencies and working directly with retailers like Amazon and eBay, so as to increase their profits.